The leafy branches of the olive tree -a symbol of abundance, glory and peace- were used to crown those who’d win at sports or in a war. As emblems of benediction and purification, they were also ritually offered to ancient Greek Gods and powerful figures. Today, they are still used in many religious ceremonies. Over the years, the olive tree has been the symbol of peace, wisdom, glory, fertility, power and purity and it is considered as a blessed plant. The cultivation of olive trees began more than 7000 years ago. As far back as 3000 BC, olives were grown for commercial reasons in Crete and may have been the source of the wealth of the Minoan civilization. The ancient Greeks used to smear olive oil on their bodies and hair, to maintain their good health. The older an olive tree is, the broader and more gnarled its trunk appears. Many olive trees are said to be hundreds of years old, while an age of 2.500 years was scientifically proven for a number of them. 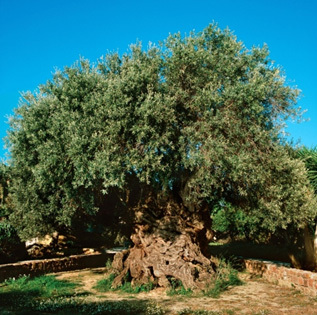 One of the oldest olive trees on the planet grows in Crete and is yearly visited by approximately 20.000 people from all over the world. The Monumental Olive Tree of Vouves has been declared a “natural heritage monument” by decision Nr. 603/17-2-1997 of the Secretary General of the Region of Crete, due to its substantial ecological and historical importance.